The Bank of Korea Gov. 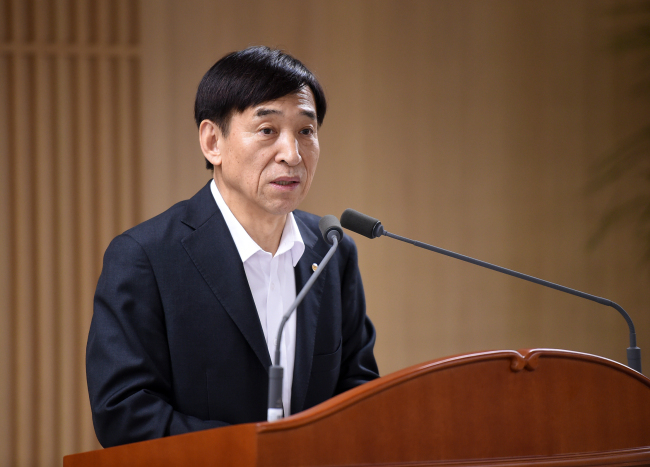 Lee Ju-yeol on Tuesday underlined that the key factors in the nation’s upcoming policy rate decisions should be growth and inflation indexes, dismissing concerns that Washington’s recent signals to accelerate its monetary tightening cycle will press Seoul to follow suit. While sidestepping direct remarks, his defensive tone regarding the nation’s economic capacity empowered speculations that Seoul will freeze its policy rate next month and delay the hike move to later in the year until inflation inches up. “The BOK has been consistent over its monetary policy approach. If the economy sustains its growth pace and inflation nears the targeted level, further alleviation of (monetary) easing may be considered,” said Lee in a luncheon meeting with reporters. The top monetary policymaker assessed the nation‘s growth and consumer prices to be ”on the right track.” In April, the bank predicted that the country would grow 3 percent with inflation reaching 1.6 percent this year. Under current circumstances, however, the central bank will keep a “stern watch“ on the market until figuring out its economic perspective and rate hike policy at the next monetary policy board meeting slated for July, he added. The BOK had previously suggested that the inflation needs to recover the 2 percent range in order to consider an additional rate hike. South Korea’s key interest rate currently remains at 1.5 percent for six consecutive months, after a 0.25 percentage point increase in November last year, marking the first hike in more than six years. Despite the reiterated wait-and-see approach, the BOK chief’s latest speech was largely taken as a slightly hawkish turn as he had recently called for the prolongation of the easing policy while the country pulls through slow growth and low inflation. “There is the need to maintain the current eased monetary policies, as the domestic economy is under low inflation pressure in terms of demands, despite overall growth,” were Lee‘s words at the BOK’s 68th anniversary last week. But notable external factors have made appearance during the past week, the top banker admitted. While the US Federal Reserve indicated that it may carry out two more policy rate hikes this year, in addition to its latest and anticipated hike to a range of 1.75-2 percent, the mounting trade tension between Washington and Beijing was seen as a potential dampener to investor sentiment. “In case the financial instability of emerging markets spread on further, the risk sensitivity of global investors may rise, which will in turn boost volatility in capital flow or prices,” Lee said. He also referred to the decision by global rating agency Moody’s Investors Service on the previous day to maintain Korea’s rating at “Aa2” on the back of its resilience to global shocks, eased geopolitical risks and sound public finances. “Despite some fluctuation in stock investment, there has been a steady capital influx into the bond funds, indicating a positive assessment of the country’s financial market,” Lee said. When asked about the country’s record-high household debt and the dilemma between the minimum wage hike and income distribution, the BOK chief refrained from detailed comments.